The ShortNorth.org blog highlights the happenings of the Short North Arts District. In Art Spotlight, we feature the artists, gallerists, performers, and professional companies of the District and explore their exhibitions, shows, and more. As the minutes of daylight add up and the days begin to lengthen, a new public art installation celebrates the various changes happening throughout the day – in sunbeams and shadows, in the blueprint of the Short North Arts District, and in the city as a whole. 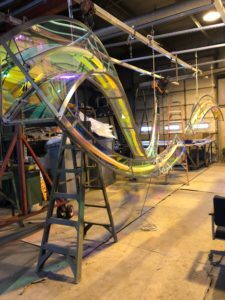 Local artists Stephen Canneto and Judith Spater are the creative minds behind Jubilation, a dynamic new sculpture that is suspended nearly 30 feet up in the air at the northwest corner of Second Avenue and High Street on The Castle building. We spoke with Canneto about his inspiration for the piece and what it means to him to be a working artist in the District. Spater was an integral part of the design process, helping to integrate the flowing, interactive forms that cross over each other in the piece and change color throughout the day with different sources of light. The process of bringing Jubilation to life started at what Canneto referred to as the “philosophical foundation,” as all of his work is site-inspired and site-specific. After viewing the worksite, Spater and Cannetor sketched the initial idea then created three-dimensional scale models of the building and installation, complete with mock ups of the LEDs inside the pieces. 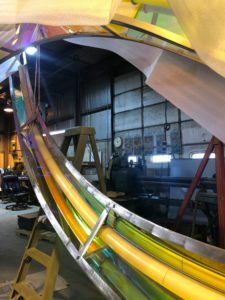 Once they presented and received approval for the piece, they moved to the design, build, and installation phases, engaging Jezerinac/Geers, engineers; Blackburn’s Fabrication; Lori Hochradel; AutoCAD; Laser Cutting Shapes; and Light It Up Columbus to complete the work. Jubilation is a project of the Short North Alliance and was made possible with support from the Borror Family Foundation and Ingram White Castle Foundation, with promotional and educational support provided by the Greater Columbus Arts Council. 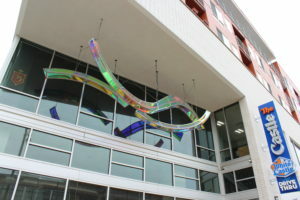 Jubilation is installed at 965 N. High St.